On January 30, the Speaker of the House of Representatives of the National Diet of Japan Tadamori Oshima received the delegation led by the RA NA Speaker Galust Sahakyan being on an official visit in Japan. Welcoming the RA NA Delegation, the Speaker of House of Representatives of National Diet of Japan Tadamori Oshima thanked the Armenian delegates for the visit to Japan and assured that by the visit of the RA NA Speaker Galust Sahakyan a start is given to a new phase of the development of the Armenian-Japanese parliamentary relations. At the meeting Mr Oshima particularly has noted that the Japanese-Armenian relations are at high level, which is a continuation of the official visit of the RA President Serzh Sargsyan to Japan in 2012. In Mr Oshima’s word, by the RA NA President’s official visit a start is given to further deepening of those relations at already parliamentary level, which has a special role on the way of the development of diplomatic relations. According to Galust Sahakyan, the quarter of a century is already sufficient time to assess the existing relations and understand their depth and content. During the past 25 years Armenia and Japan have formed dynamic format of cooperation based on good will, partnership and mutual interests. The RA Head of the Parliament also touched upon the Nagorno Karabakh problem and the Armenian Genocide, particularly noting that the problems should be solved exclusively through peaceful means, and the condemnation of committed crimes has a special role in prevention of genocides. Expressing his condolences on the victims of the April war, the Speaker of the House of Representatives of Japan has stated that Japan sees the solution of the Karabakh conflict exclusively through peaceful means and continues supporting the works of the OSCE Minsk Group. 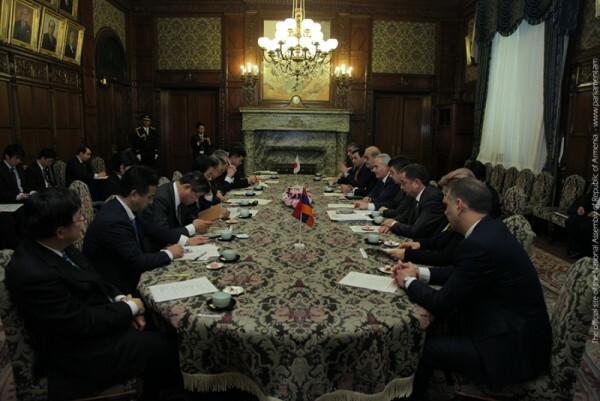 The delegation led by the RA NA Speaker Galust Sahakyan had also meetings with the President of Japan External Trade Organization (JETRO) Yasushi Akahoshi and the President of Japan International Cooperation Agency (JICA) Shinichi Kitaoka. Issues regarding the economic, cultural and trade relations were discussed, pre-indicating concrete programmes, which in future will be fulfilled. Let us remind that the NA deputies Vahram Baghdasaryan,Ruzanna Muradyan and Samvel Farmanyan, the RA Deputy Foreign Minister Armen Papikyan and RA Ambassador Extraordinary and Plenipotentiary to Japan Hrant Poghosyan are in the delegation.